So I happened to say in the course of talking about something else, about how one of my lifelong dreams was having someone throw me a surprise party. I just mentioned it in passing, in part of answering a question about ways to win my heart. 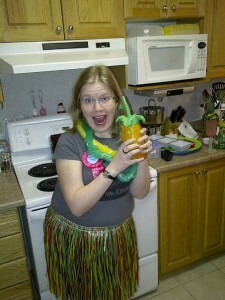 Some awesome friends of mine happened to notice this, and actually threw me a surprise party (for my half-birthday). I have to say, I was 100% surprised, didn’t suspect a thing at all! AT ALL. It was awesome. Seriously one of the most awesome things ever. Also they got me a cake! And made me drinks and played games and it was thoroughly awesome. And Trevor took that crazy photo of me. Yay! Trevor picked up the Dragon Age: Origins Ultimate Edition (Dragon Age: Origins, along with all the downloadable content, and Awakenings). He picked it up because he thought he’d like to play it, and I took to it quicker than he or I expected. And I’m a huge fan. I’ve never really gotten into an RPG video game as much I have this one. I think part of it is the characters- I find them very engaging, and I definitely enjoy all the character interactions. The story is pretty awesome as well. And the voice acting! Some really amazing voice work on this title. I recognized a few voices right away (Tim Russ, Kate Mulgrew, Tim Curry) but I also really enjoyed the work from people whose voices I didn’t know (Steve Valentine, Steve Blum, Corinne Kempa, etc). I finished my first play-through last night, and I’m going to have to start a new game and try some things differently- I think I’ll have to play through 3 times more at least in order to try all the things I want to. Another thing that’s awesome about the game- the score. It’s my first real introduction to Inon Zur as a game composer. He’s done other games, but none that I’ve played. I was seriously an instant fan. He makes great use of horns and brass, writes gorgeous melodies (a sure way to win me over) and has great orchestrations that really evoke images and emotions better than any I’ve come across in a game before. I love film music and game music, and he’s definitely one of my new favourites. A little sun (especially in the morning and afternoon when I’m going to or from work) makes everything better. As much as I avoid too much sun exposure (fair skin and a family history of skin cancer makes for a healthy avoidance of sun damage) I love a nice sunny day in the winter. Do you have one of these? I have this sort of army-green sweater with a huge cowly turtleneck, and I feel like a million bucks in it. Wearing this sweater just makes my day that much more awesome. I wish I had one for every day of the week. I have to wear corrective lenses to drive, and thus, sunglasses become more difficult, as I’m not a contacts person. Enter the sunglass clip, that clips on to your existing eyeglasses! They’re much nicer nowadays than the flip-up clips from the 80s, and I’m super happy to have mine. I don’t really like transistions or photo-grey lenses, because I think they don’t go back to clear soon enough or fully enough. So this is a perfect solution for me. My ears stick out from my head in such a way that finding headphones that fit and stay comfortable over a decent length of time is difficult. At work, recently, we all got new headphones that are actually comfortable for me, and really nice for audio work or listening to music while we’re working! 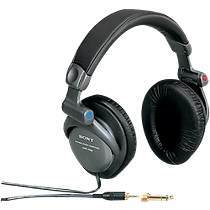 They’re the Sony MDR-V600 model. I love them. 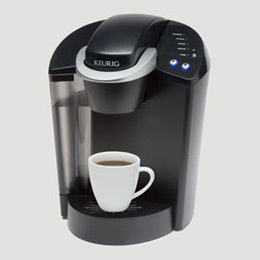 I am kind of in love with my coffee maker. Trevor got it for me for my birthday a few years back, and it is seriously magical. It’s one of those cup-at-a-time makers, and since I am the only one in the house who drinks coffee, it’s perfect for me. I also recently found a shop near me (Tweed and Hickory) that sells a huge variety of K-cups, and particularly my favourite kind (Creme Caramel! ), in the larger box size. Yes! I’ve never really been a fan of the Cadbury Creme Egg. All that goo in the middle was too much for me. Too much sugary goo, not enough chocolatey outside. And too big to eat without making a mess. This year, some friends of mine told me about the MINI Creme Egg. So I bought a tube of them (they sometimes come in tubes, apparently) over the weekend, and tried them. They are lovely and perfect. Much better chocolate-to-goo ratio, easier to eat, and not so huge. Hooray for the Mini Creme Egg! At work, we have chili cookoffs twice a year, with the money raised going to charity. I make a chili most of the time, and I also have been running the cookoffs for the past few times. It has gone pretty well! We raise a good amount of money for whatever charity we’re giving to, and the chili is awesome. I usually enter a chili, but I never win. This time I got a good amount of votes though! I was pleased. Hooray for chili cookoffs! The production of The Penelopiad that was involved with last fall was entered in the Western Ontario Drama League festival as an “Out of Festival” entrant (meaning that we were not planning to be eligible to take the show to the festival that happens each year. The production won two awards- Best Ensemble, and an adjudicators award that was named “Fearless Theatricality or Theatre on a Shoestring Award”, haha. It was awesome. The first show KWLT has had adjudicated in a long time, and we made quite a good showing. Our director was nominated for Best Direction as well. Awesome!